We will start the new year with a series of vegan recipes that I cooked the past month but was too busy to post. 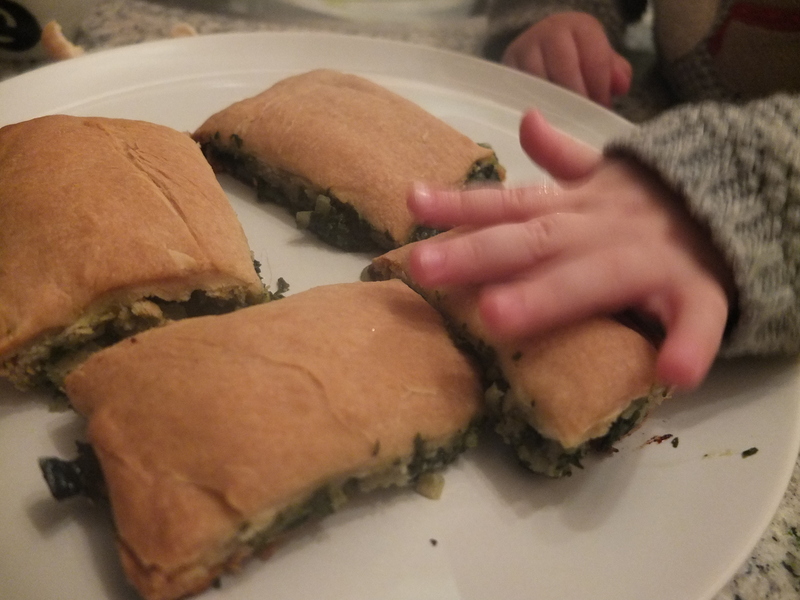 Let’s start with this vegan spinach pie. I made this one today as I wanted to prepare something that needs some time, to keep my toddler busy. She loves to watch me cook and is happily standing on her wooden stool for as long as I need to prepare whatever I am making, as long as I let her help a bit. For the filling you can let your imagination go wild. I will put here a suggestion list of ingredients. 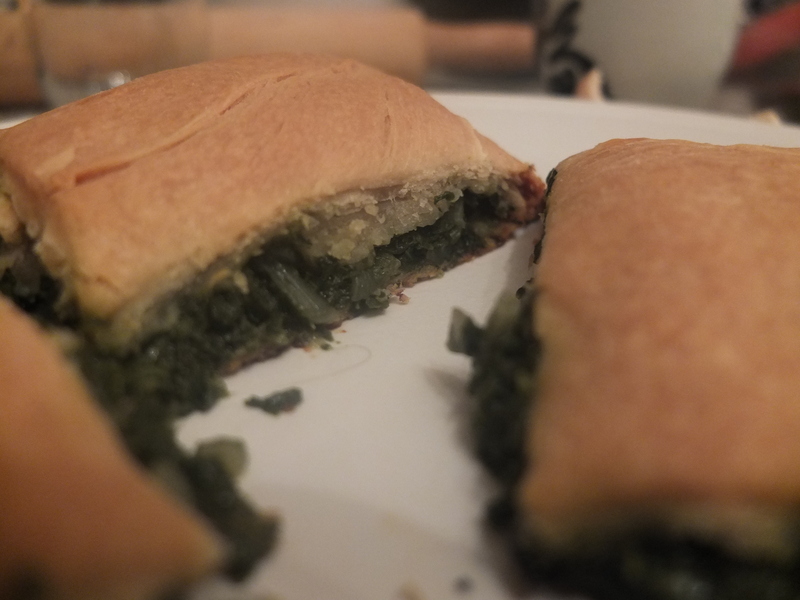 I used about 1/2 kg of spinach, 3 large onions, 3 garlic cloves and tons of herbs. In a large bowl pour the water and olive oil and add in the baking soda and salt. Add flour while kneading till you have a soft dough. Separate the dough in two parts and let the dough rest for 30 minutes covered with a kitchen towel or plate, while you prepare the filling. To prepare the feeling, just saute all the ingredients with a bit of olive oil for about 10 minutes on low heat. Spread the filo dough using a rolling pin. Make sure that each filo is big enough to cover your baking pan. 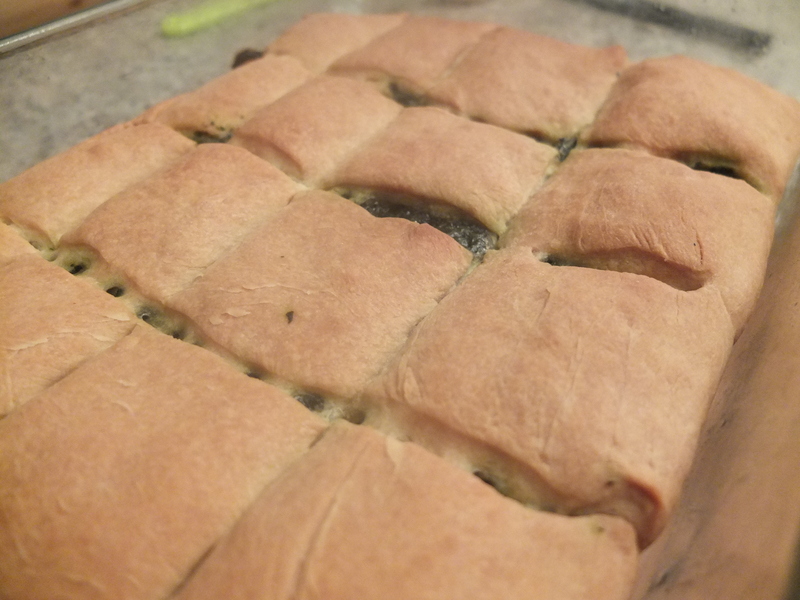 Oil your baking pan and spread one filo sheet on it. Put the other filo dough on top. You can use a knife to trace pieces if you want. That will make cutting your pie much easier. Bake at 200 C for about 50 minutes or until the filo turns golden. This pie is great with a cup of tea and you can also enjoy it at room temperature. It keeps for a couple of days in an air-tight container but it’s better to keep it in the freezer if you are going to keep it longer. You see that baking pan full of pie? Well, it’s almost empty 5 hours later.